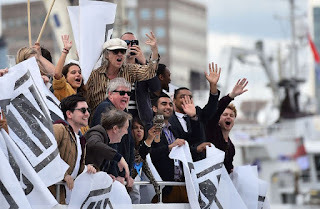 Did Bob Geldof win the Brexit Referendum for Leave? His little antic on the Thames in the run up to the vote probably convinced a few hundred thousand Sun readers which side they were on. That's what happens when you're a member of the IYI elite (Taleb's label: Intellectual-Yet-Idiot). But as James Traub signals, the elite are beginning to realise that they belong to a tribe too, and maybe they should 'ingather' as well to protect themselves from those other, nasty tribes. Heck, even The Guardian is beginning to realise that 'elections are bad for democracy'. IYI indeed. Societies in decline, he pointed out, schism into two unequal parts: a dominant minority that monopolizes the political system and its payoffs, and an internal proletariat that carries most of the costs of the existing order of things and is denied access to most of its benefits. As the schism develops, the dominant minority loses track of the fundamental law of politics—the masses will only remain loyal to their leaders if the leaders remain loyal to them—and the internal proletariat responds by rejecting not only the dominant minority’s leadership but its values and ideals as well. Toynbee famously once observed that 'civilizations die from suicide, not by murder'. It's a well established pattern apparently. But what we've seen from a wide range of writers and analysts in the days since the Brexit vote is not necessarily worry. It is shock. Fury. Disgust. Despair. A faith has been shaken, illusions shattered, pieties punctured. This is what happens when a life-orienting system of belief gets smashed on the rocks of history. The name of that shattered system of belief? Progressivism. The European Union may well be the purest and most ambitious experiment in progressivism ever attempted — a transnational economic and political entity founded entirely on the moral premises of humanitarian universalism, which is to say on the negation of particularistic attachments. ...But what if progressivism isn't inevitable at all? What if people will always be inclined by nature to love their own — themselves, their families, their neighbors, members of their churches, their fellow citizens, their country — more than they love the placeless abstraction of "humanity"? In that case, the act of ignoring or even denigrating this love will have the effect of provoking its defensive wrath and ultimately making it stronger. As I said before, I think the biggest fallout from Brexit will be political not economic (the latter may even prove benign for the UK, though probably not for Ireland). But the political consequences could be very dire indeed if they amount to a 'coup d'etat' by Europe's IYI elite should they tire of the whole democracy thing. The retreat to the caves has begun. Geldoff's bien pensant activism is really rather tedious, still rebelling against the Holy Ghost brothers from Blackrock College I suppose.